Summer’s heat is as predictable as winter’s chill. 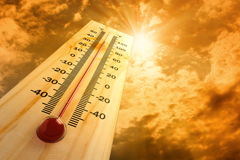 Heat-related illnesses—and even deaths—are also predictable. But they aren’t inevitable. In fact, most are preventable. Most healthy people tolerate the heat without missing a beat. It’s not so easy for people with damaged or weakened hearts, or for older people whose bodies don’t respond as readily to stress as they once did. There are three different levels of heart-related illness: heat cramps, heat exhaustion, and heat stroke. Some simple choices can help you weather the weather. Drinking water and other hydrating fluids is essential. Putting off exercise or other physical activity until things cool down also helps. Chilled air is the best way to beat the heat. Sticking with smaller meals that don’t overload the stomach can also help.